The visitors’ center at Abraham’s Well. Photo by Esther Hecht. Beersheba is a happening city, with a buzz heard throughout Israel. This once-sleepy town on the northern edge of the Negev Desert now covers 45 square miles and has an astonishing number of parks and fountains. Ever more high-rise apartment buildings tower over the old city, Beersheba’s cultural heart. Situated 70 miles southeast of Tel Aviv, Beersheba serves a metropolitan population of one million, including some 100,000 Bedouins. Thanks to its dynamic mayor, university and the Israel Defense Forces’ decision to build a new training complex in the Negev and to move its high-tech facilities south, the city is also a fast-growing center for high-tech that the prime minister has dubbed Israel’s “cyber capital.” In October 2015, the government signed an agreement to provide the infrastructure for 20,000 new housing units by 2019. Beersheba was first settled 6,000 years ago by people who dug their homes in the earth, raised cattle and produced metal tools. The town figures prominently in Genesis, which explains Beersheba’s name by recounting that both Abraham and his son Isaac dug seven wells (be’er in Hebrew) there and that Abraham cemented an alliance with Abimelech, king of the Philistines, by setting aside seven ewes (sheva in Hebrew is both seven and the root of the word oath). After leaving Beersheba, Jacob dreamt about the angels going up and down a ladder to heaven. According to the Sages, the ladder’s base was in Beersheba. After the Israelite conquest (14th century B.C.E. ), Beersheba became a center of Israelite settlement. It was settled by Jews after the return from exile in Babylonia (ca. 538 B.C.E.). Following the destruction of the Temple in 70 C.E., Beersheba was a Roman garrison town. After the Arab conquest (seventh century), the city lost significance. The modern city began in 1900 when the Ottoman sultan created a new regional capital in Beersheba. German and Swiss engineers laid out the city on a grid. A grand mosque, governor’s mansion, school, post office and telegraph office were built, as were homes with running water. In 1914, there were about 800 Muslim inhabitants and a few Jewish families. During World War I, the town was the main base of the Turko-German Army on the Suez and Sinai front. A railway line was built in 1915 to move supplies to the southern front. After the Turks withdrew from Sinai, Beersheba was key in blocking the British advance northward. But in 1917, in a surprise attack, the Allied forces under General Allenby, including many Australians and New Zealanders, conquered the town, opening Palestine to the British. After the war, Beersheba declined; by 1931, only 11 Jews remained, and they left during the 1936 to 1939 Arab riots. During the War of Independence, the town was the Egyptian army’s Negev headquarters, but was conquered by Israeli forces in October 1948. In 1949, 1,800 Jews, mostly new immigrants, settled there. By 1968, there were 70,000—mainly new immigrants from North Africa, Iraq, India, Romania, Poland, Hungary and South America. At first, municipal offices were in the old part of the city, but then moved out as new neighborhoods were established. In 1967, Beersheba became the capital of Israel’s Southern District. Big industries included ceramics, bricks, pesticides and other chemicals and bromide compounds—all based on Negev minerals. In 1957, the Negev Institute for Arid Zone Research opened. 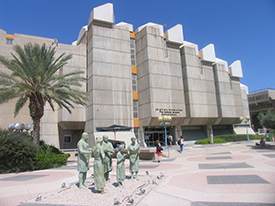 The Institute for Higher Education, opened in 1965 and became the University of the Negev in 1970. It was renamed Ben-Gurion University of the Negev after the death in 1973 of legendary Prime Minister David Ben-Gurion, for whom settling the Negev was a prime mission. Beersheba boasts that among its 200,000 residents are immigrants from 73 countries. In 2005, some 30 percent of residents were immigrants who had arrived since 1990 (compared with about 12 percent in Tel Aviv). Among them is a concentration of chess champions and grand masters, who asked to settle in the city because of its outstanding chess club. The city is home to the Light Opera of the Negev, which performs around the country. Beersheba residents are avid soccer fans, and a new 16,000-seat stadium has been built to accommodate them. A few of the city’s 300 synagogues have Anglo connections, including Eshel Avraham, founded by immigrants from North America (Conservative; www.eshel-av.org), and the Orthodox Hakippah synagogue. Negev Museum of Art. Photo by Esther Hecht. The Hadassah chapter has about 100 members (contact: jane_bouchard@yahoo.com). Perhaps Beersheba’s biggest surprise is its 40 fountains—most of them are lit up at night—and the sound of water in this desert climate. The old city is bounded in the southeast by the Abraham’s Well International Visitors’ Center and in the northwest by the old train station. The mostly low-rise Ottoman buildings are gradually being renovated after decades of neglect to provide student housing, tourist accommodations and venues for culture and entertainment. Many of the important sites are clustered on Ha’atzma’ut Street and the adjacent Keren Kayameth LeIsrael Street. At the southeastern end of KKL Street, on the banks of the Beersheba River, Abraham’s Well is a reminder of the city’s importance as a source of water. The visitors’ center, shaped to resemble Abraham’s tent, has a multimedia exhibit in which visitors walk alongside the patriarch. Three of the four main Ottoman buildings, northwest on KKL Street, are now cultural sites. The Great Mosque (built in 1906), with its typically Ottoman large dome, arched windows and narrow minaret, was the first mosque built in the Negev. In 1952, it became the Negev Museum of Archeology. But the mosque and the adjacent governor’s mansion, built of soft local stone, were deemed dangerous and closed in the 1990s. The mosque reopened in 2011 as the Museum of Islamic and Near Eastern Cultures. The courtyard, graced by fruit trees and a star-shaped fountain faced with Armenian tiles, displays archaeological finds. Temporary exhibitions combine traditional and contemporary art (60 Ha’atzma’ut Street). Next to the mosque, the two-story governor’s mansion, with its graceful stone arches and vast courtyard, served as Beersheba’s City Hall from the 1950s to the 1970s. 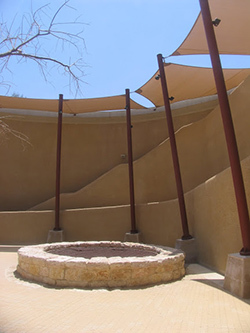 It then became the art wing of the Negev Museum of Archaeology. 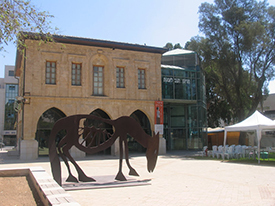 In 2004, the building underwent conservation and renovation, reopening as the Negev Museum of Art. Its three galleries display Israeli and international art (60 Ha’atzma’ut Street). Opposite the museum stands the Seraya—once the Ottoman administrative building—now used by the IDF. Nearby, the Ottoman-built first school for Bedouin children now houses on its grounds the Carasso Science Park (79 Ha’atzma’ut Street). The complex has 10 interactive exhibitions suitable for children of all ages on scientific fields, including communication, genetics and nuclear energy, in addition to a Bedouin heritage display. Less than 400 yards north is the revamped Ottoman train station, which was in use between 1915 and 1927 and today is surrounded by high-rise apartment buildings (Eli Davis Street). The main exhibit is a restored steam locomotive bearing the numerals 70414, the number of Israel Railways’ last steam locomotive, immortalized in a popular Hebrew song. There are also three historic cars, and a sound-and-light show illuminates the cars at night. The old station building contains an art gallery and a restaurant, and the stationmaster’s home houses a small Israel Railways museum. 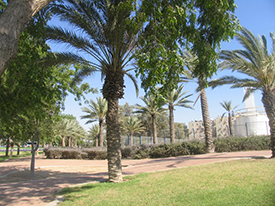 A Hadassah-JNF park. Photo by Esther Hecht. Israeli and Turkish flags fly side by side just east of the compound in Ataturk Plaza, which has a bust of Mustafa Kemal Ataturk, the founder of the Turkish Republic, and a stone obelisk commemorating the 298 Ottoman soldiers who died in the 1917 battle. So important was that battle that several sites are dedicated to the ANZAC horsemen. First—near the old train station—is the well-kept Beersheba War Cemetery, the resting place of 1,239 British, Australian and New Zealand soldiers. Captain Seymour Van den Bergh, 27, of the Middlesex Hussars is buried in grave Q13. His grave is marked with a Star of David and the words, “So far from home, yet so near to those who love him.” The remains of six other Jews have been reinterred elsewhere. Another memorial is the Park of the Australian Soldier—about two miles northeast of the cemetery, at the corner of Abba Ahimeir and Shaul Hamelech—with a commemorative statue of a mounted Australian horseman. Established in 2008 by the Pratt Foundation, the park includes a large playground with sunshades and equipment that is suited to children with special needs. Allenby Park, laid out by the Ottomans and recently renovated, has a bust of Allenby and a detailed description of the battle (corner of Herzl and Ha’atzma’ut Streets). Just a couple of blocks west of Allenby Park is The Artists’ House of the Negev, with a rich collection of the work of local artists and craftspeople (55 Ha’avot Street; 972-8-627-3828). In 1949, Hadassah took over an IDF hospital and established the Haim Yassky Hadassah Negev Hospital in Beersheba, later adding a maternity ward and nursing school. It operated until 1959, when it was supplanted by a hospital built by the Histadrut; is is known today as the Soroka Medical Center. The Hadas Cohen bridal shop now stands on part of the site of the Hadassah hospital. In 1998, in conjunction with the Jewish National Fund–Keren Kayemeth LeIsrael, Hadassah built a large park at the northern entrance to the city. Its broad lawns and shade trees were designed by landscape architect Tsvi Dekel. The large tower-shaped sculptures, each of which is named for a planet, are by Israel Hadani. Hadassah’s most recent project, in conjunction with the JNF, is a 15-acre forest begun in 2014 during Operation Protective Edge. It is adjacent to Beit Eshel, a Jewish settlement established by Holocaust survivors in 1943. The forest, with eucalyptus and fruit trees, is part of the 1,334-acre Beersheba River Project, which is replacing mountains of construction debris with walking and bicycle paths, an amphitheater and a 175-acre lake. The core of the project is slated to be completed by 2018. The library at Ben-Gurion University of the Negev. Photo by Esther Hecht. Beersheba is called Israel’s capital of Brutalism—an architectural movement that takes its name from the French béton brut (“raw concrete”)—because it has a variety of buildings made of that material. Concrete was prevalent in Israel’s early decades because it was local, plentiful, cheap and suited to the climate. Avraham Yaski, master planner for Ben-Gurion University of the Negev’s campus, chose to use concrete, which allows for sculptural shapes and a “corduroy” finish that shades itself—as on the Kreitman Building and the library. Public buildings, such as City Hall, Beit Yad Lebanim (memorial for Israel’s fallen) and the infamous 273-yard-long apartment block, were built of concrete. So, too, were synagogues, for example, the pyramidal Central (Iraqi) Synagogue named after Eliahou Khalastchi (5 Montefiore Street) and Hakippah Synagogue (22 Hatzvi Street), so called because the roof is a concrete dome (though mainly obscured from the outside because of the addition of a women’s section). Also built of concrete is the memorial to members of the Palmah Negev Brigade who fell during the War of Independence, by Israeli artist Dani Karavan. On a hill overlooking Beersheba’s new high-tech center, it consists of a perforated tower and 17 other angular and rounded forms. The new center, which already houses Israeli branches of such internationl giants as IBM and Hewlett Packard, and the Pipes Bridge for pedestrians and cyclists that connects it to Ben-Gurion University of the Negev, reflects the variety of materials used in newer architecture in the city. For a different experience, visit Mishkan Hatchelet, where 1,000 talitot are manufactured daily in accordance with Jewish law. Visitors can make their own tefilin. Tours, including refreshments, are free, but must be booked in advance (972-54-590-6661; refael@mishkan100.co.il). 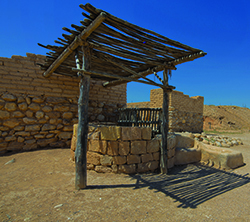 Tel Beer Sheva, a few miles east of the modern city, was inhabited in the fourth millenia B.C.E. and again from the 12th century B.C.E., thanks to its water supply and rich soil. Architectural finds include a system of walls and gates, residential buildings and water systems. Tel Beer Sheva. Photo courtesy of Dafna Tal/GoIsrael.com. The Israel Air Force Museum displays 150 aircraft from all periods of Israel’s air history, from the Messerschmitt of the War of Independence to the Phantom of later wars (in Kibbutz Hatzerim, five miles west of Beersheba; 972-8-990-6888). The forces of modernization have led to the rapid disappearance of Bedouin culture. However, it can still be witnessed at the Joe Alon Center, 15 miles northeast of Beersheba, where Bedouin guides explain the exhibits. The Saint of Beersheba (SUNY Press) by Alex Weingrod is an anthropological study of the creation of a Jewish saint in Israel—Rabbi Chayim Chouri (1885-1957)—and the annual pilgrimage to his grave in Beersheba. In Beersheba: A Journey through Australia’s Forgotten War (Melbourne University Publishing), Paul Daley recounts the last great cavalry charge and the capture of Beersheba by the Australian and New Zealand Army Corps, which was a turning point in Britain’s war against the Ottoman Empire. The film Forty Thousand Horsemen (1940) was directed by Charles Chauvel, whose uncle commanded the ANZAC desert corps in Palestine. The Lighthorsemen (1987), directed by Simon Wincer, follows the battle through the story of four Australians. Israeli actress Ronit Elkabetz, who starred in The Band’s Visit and Gett: The Trial of Viviane Amsalem, was born in Beersheba. So, too, were popular singers Zahava Ben and Yehudit Ravitz, comedian Orna Banai and actress Hanna Azoulay Hasfari. Eliahu Levant, who emigrated from St. Petersburg in 1972 and founded the Beersheeba chess club, focuses on teaching chess to children from age 4. Israeli astronaut Ilan Ramon, who died in the Columbia space shuttle disaster in 2003, grew up in Beersheba. Spring and fall are the best seasons for visiting the city, which is 80 minutes from Tel Aviv by train and slightly more by car. Beersheba boasts that its Grand Canyon mall—which has a popular food court—is the largest in the Middle East. For authentic flavor, sample restaurants in the old city. At Kebab Emuna (58 KKL Street; 972-8-627-6825), start with creamy hummus and laffa bread. For fine dining go to Yakuta and try Moroccan cuisine such as hreira (a slightly sour vegetable soup) or calf brain in a piquant tomato sauce (23 Mordei Hageta’ot; 972-8-623-2689). Café Lola prides itself not only on its homemade condiments and Mediterranean cuisine but also on being a place for art, music and cinema (nonkosher, but has many vegetarian options; 13 Smilansky Street; 972-8-628-8937). Beit Yatziv (79 Ha’atzma’ut Street), next to the Carasso Science Park in old town, offers moderately priced accommodations. Bayit Ba’atika is a bed and breakfast in the beautifully restored home of onetime Hadassah hospital administrative director Yisrael Shilat and his wife, Ruth Shilat, one of the hospital’s first midwives. The tasteful furnishings include vintage photographs of the hospital (24 Gershon Dubenboim Street). As you zip out of this bustling modern city in a car or on a modern, air-conditioned train, think how far the city has come from the days when a train trip to Beersheba was a long, dusty journey. Didn’t get to see all that the city had to offer. But will go back and visit. One small mistake: the Eliahou Khalastchi synagogue in on Montefiore Street in the Aleph quarter. The Kippa synagogue is on 22 Hatzvi Street.